Serving the Midwest with tuckpointing, masonry restoration, and exterior building repairs. Tuckpointing, masonry restoration, and exterior building repairs. Tuckpointing is one of the most common services BRC provides. 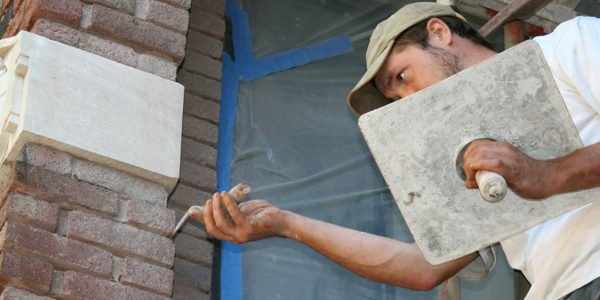 Our craftsmen have mastered the art of mortar repairs. Start making what you're worth at BRC. Work with new tools and equipment and earn the industry’s best wages and benefits. BRC offers a wide range of masonry restoration services including tuckpointing, caulking, thru-wall flashing, cleaning, and sheet metal design. Building Restoration Corporation is the Midwest’s premier restoration contractor providing added-value masonry corrective cleaning, repair and replacement for brick, block, stone, pre-cast concrete and other masonry materials. Our experienced team of craftsmen have been diagnosing, correcting and repairing issues in historic buildings, commercial building, and industrial buildings since 1985. Building Restoration Corporation’s expertise is in managing the entire restoration process, from the evaluation of your building to the completion of any restoration services your building needs. Our goal is to help you develop and execute a plan for your building to take care of all its restoration needs, all the while staying within your budget.